You are John Jack, the world's busiest professional killer, hired by criminal organization H.A.R.M., whether you like it or not. After passing a test of survival against the henchmen of Dmitrij Volkov on Malta, H.A.R.M. 's Director of Executive Actions orders you to find out why an Italian rival criminal organization, known as "Danger! Danger! ", is interested in a military base in Czechoslovakia. Upon infiltrating the base, you discover it is a secret rocket launch facility and that Il Pazzo, leader of "Danger! Danger! ", intends to hijack a rocket to rescue a mad scientist, Dr. Harij, from the moon. Dr. Harij previously worked on H.A.R.M. 's space station which was destroyed by a meteor shower. Dr. Harij however survived the disaster and even managed to build a moon base from the space station's debris. Upon learning of Dr. Harij's survival and Il Pazzo's plan to recruit him for his own purposes, Volkov instructs you to rescue the scientist before his rival manages to do so. Eventually it comes down to a final battle on Il Pazzo's home turf in Southern Italy. Although Contract J.A.C.K. 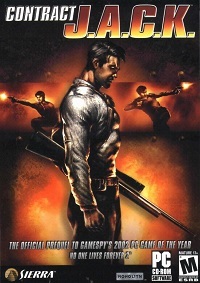 (which, in addition to the protagonist's name, is also the abbreviation of Just Another Contract Killer) is a prequel to "No One Lives Forever 2: A Spy In Harm's Way" (though released after it), it is in no shape or form similar to the NOLF games. Not only does it feature a male protagonist, replacing secret agent Cate Archer of UNITY by a rogue killer working for H.A.R.M., it is also plain first-person shooter which lacks the gadgets and stealth aspects. You can choose to play the single player story mode over 7 chapters or play multiplayer games with four different modes: Deathmatch, Team Deathmatch, Doomsday or Demolition. Overall the game was perceived as a low note in the highly praised No One Lives Forever series and even seemed to be put on the store shelves in a format that lacked what was originally planned, with re-used graphics, sounds, music and hardly a story line or character depth. In addition the game can be completed in a rather short time frame. It turned out to be the last entry of the NOLF series so far. Luckily Monolith redeemed itself with the release of the successful F.E.A.R. franchise in 2005.